PM #40762529 $5.00 • Vol. 29, No. 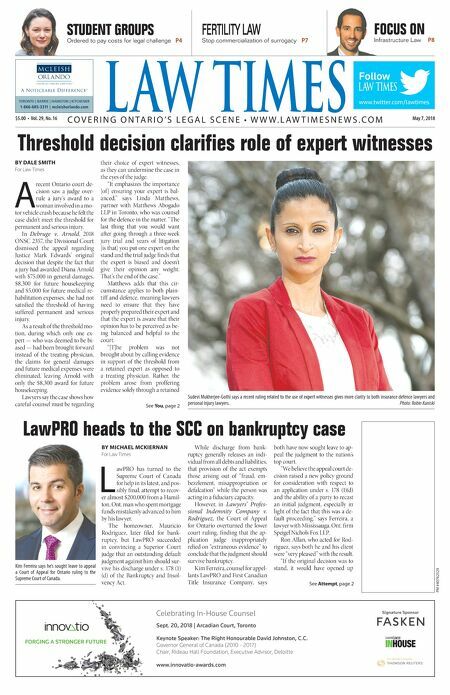 16 May 7, 2018 L AW TIMES C O V E R I N G O N T A R I O ' S L E G A L S C E N E • W W W . L A W T I M E S N E W S . C O M Threshold decision clarifies role of expert witnesses Sudevi Mukherjee-Gothi says a recent ruling related to the use of expert witnesses gives more clarity to both insurance defence lawyers and personal injury lawyers. Photo: Robin Kuniski STUDENT GROUPS Ordered to pay costs for legal challenge P4 FERTILITY LAW Stop commercialization of surrogacy P7 FOCUS ON Infrastructure Law P8 BY DALE SMITH For Law Times A recent Ontario court de- cision saw a judge over- rule a jury's award to a woman involved in a mo- tor vehicle crash because he felt the case didn't meet the threshold for permanent and serious injury. In Debruge v. Arnold, 2018 ONSC 2357, the Divisional Court dismissed the appeal regarding Justice Mark Edwards' original decision that despite the fact that a jury had awarded Diana Arnold with $75,000 in general damages, $8,300 for future housekeeping and $5,000 for future medical re- habilitation expenses, she had not satisfied the threshold of having suffered permanent and serious injury. As a result of the threshold mo- tion, during which only one ex- pert — who was deemed to be bi- ased — had been brought forward instead of the treating physician, the claims for general damages and future medical expenses were eliminated, leaving Arnold with only the $8,300 award for future housekeeping. Lawyers say the case shows how careful counsel must be regarding their choice of expert witnesses, as they can undermine the case in the eyes of the judge. "It emphasizes the importance [of ] ensuring your expert is bal- anced," says Linda Matthews, partner with Matthews Abogado LLP in Toronto, who was counsel for the defence in the matter. "The last thing that you would want after going through a three-week jury trial and years of litigation [is that] you put one expert on the stand and the trial judge finds that the expert is biased and doesn't give their opinion any weight. That's the end of the case." Matthews adds that this cir- cumstance applies to both plain- tiff and defence, meaning lawyers need to ensure that they have properly prepared their expert and that the expert is aware that their opinion has to be perceived as be- ing balanced and helpful to the court. "[T]he problem was not brought about by calling evidence in support of the threshold from a retained expert as opposed to a treating physician. Rather, the problem arose from proffering evidence solely through a retained See You, page 2 LawPRO heads to the SCC on bankruptcy case BY MICHAEL MCKIERNAN For Law Times L awPRO has turned to the Supreme Court of Canada for help in its latest, and pos- sibly final, attempt to recov- er almost $200,000 from a Hamil- ton, Ont. man who spent mortgage funds mistakenly advanced to him by his lawyer. The homeowner, Mauricio Rod riguez, later filed for bank- ruptcy, but LawPRO succeeded in convincing a Superior Court judge that an outstanding default judgment against him should sur- vive his discharge under s. 178 (1) (d) of the Bankruptcy and Insol- vency Act. While discharge from bank- ruptcy generally releases an indi- vidual from all debts and liabilities, that provision of the act exempts those arising out of "fraud, em- bezzlement, misappropriation or defalcation" while the person was acting in a fiduciary capacity. However, in Lawyers' Profes- sional Indemnity Company v. Rodriguez, the Court of Appeal for Ontario overturned the lower court ruling, finding that the ap- plication judge inappropriately relied on "extraneous evidence" to conclude that the judgment should survive bankruptcy. Kim Ferreira, counsel for appel- lants LawPRO and First Canadian Title Insurance Company, says both have now sought leave to ap- peal the judgment to the nation's top court. "We believe the appeal court de- cision raised a new policy ground for consideration with respect to an application under s. 178 (1)(d) and the ability of a party to recast an initial judgment, especially in light of the fact that this was a de- fault proceeding," says Ferreira, a lawyer with Mississauga, Ont. firm Speigel Nichols Fox LLP. Ron Allan, who acted for Rod- riguez, says both he and his client were "very pleased" with the result. "If the original decision was to stand, it would have opened up See Attempt, page 2 www.twitter.com/lawtimes Follow TORONTO | BARRIE | HAMILTON | KITCHENER 1-866-685-3311 | mcleishorlando.com cLeish Orlando_LT_Jan_20_14.indd 1 14-01-15 3:15 PM Celebrating In-House Counsel Sept. 20, 2018 | Arcadian Court, Toronto Keynote Speaker: The Right Honourable David Johnston, C.C. Governor General of Canada (2010 - 2017) Chair, Rideau Hall Foundation, Executive Advisor, Deloitte FORGING A STRONGER FUTURE www.innovatio-awards.com Signature Sponsor Untitled-5 1 2018-05-02 12:58 PM Kim Ferreira says he's sought leave to appeal a Court of Appeal for Ontario ruling to the Supreme Court of Canada.